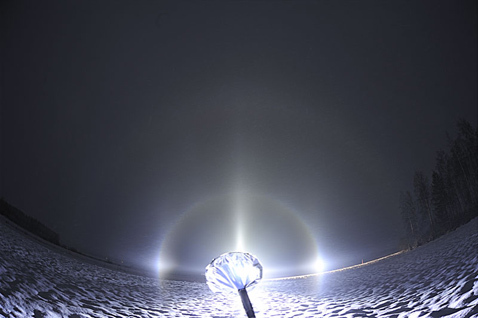 On the evening of 11 December diamond dust development near to skiresort in Sievi and in a spotlight beam a halo display was seen. Reflected Lowitz arcs ( 1 ) were rising from the parhelia, other halos were 22° halo, parhelic circle and 46° halo. 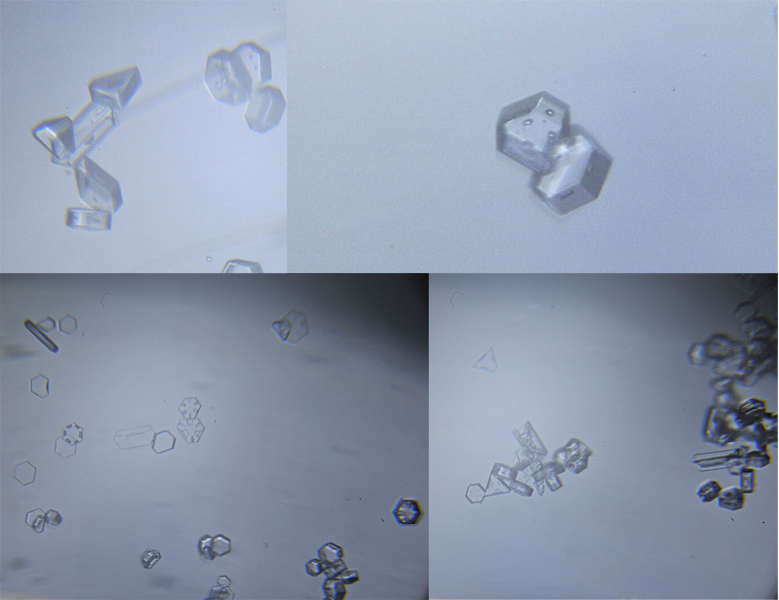 I took some crystal samples which shows structure of crystals ( 2 ). On a later stage of the display one photo ( 3 ) looked quite weird, it seems there is a 18º halo present, but is it 18° halo or something else? There are at least two additional halorings inside the strongest 22 halo. These must be due to thickenings of crystal swarm between the camera and the lamp. The Minnaert-cigar surface is perhaps completely lit by the beam, and some more dense crystal areas seemingly produce halorings instead of continuum of light. Maybe...? Pyramid crystal halos do not fit in the scheme, I think. There wasnt any pyramid crystals on crystal photos, so those must be somekind dense crystalswarm effect. Distance to skiresort was 6km. That's right, at least two rings. Actually you can sort of imagine the Minnaert cigar from that photo: the 22 halo is strangely sharp from the outer edge but is diffusing inwards in the form of these circles. I recall Mikkilä told in email that this was about 6 km from snow guns? I would not expect much density variation in the swarm at such a distance, but apparently it is better not to expect too much. Anyway, my next posting of 7/8 December display may give some more light on this. Is there some superparhelia stuff going on in (1)? Nice display. No, those are from lamp and seems that lamp was aslant. 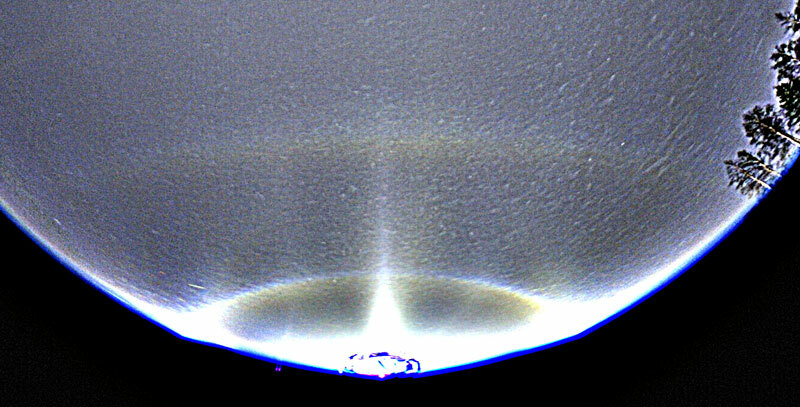 Yeah I agree there are no pyramid crystals in the sample so the 22d halo is visible in small clouds near and far from the lamp. The halo most likely forms a cone with its tip at the lamp and is sort of like a halo tube or tunnel. Big question now is this all these lamp displays and no superparhelia? I am surprised. If there is a heavy crystal swarm with mostly or all plates I think with the Hi-Performance lamp should make probably the best superparhelia around along with other divergent light halos. Someone's got to do it I hope I get to when I get me a paint gun. Superparhelia are not there because the light beam is quite narrow. The light can almost be considered parallel (although this is not exactly true like Mikkilä's photos above show). Michael is presenting a central question. The rarity of superparhelia is buggin me. Last winter I did not see at all, even though observed displays also under different divergent lamps. This winter I saw it once at Ylläs: from a lamp that was on the ground and pointing pretty much straight up (lighting up flag poles). That was one huge superparhelia. Anyway, for seeing it, ordinary construction site floodlight it the best. With spotlight there seems to be no chances. Good to hear Michael you are going to get a paint gun! One thing that came to my mind looking at these images is a posting from last Christmas made by Marko R. and Jari L. There, in an animation we can also see the cross section of Minnaert's cigar very well. Yeah I just got a paint gun today for 30 US dollars now I need some warm water a little clay for nucleation a light and some single digit or below zero temps. Oh yeah don't forget the camera. Great news, Michael! I can't wait to see your first pictures. Wishing you good halo-making conditions! Yep I have everything I need just waiting for the single digit or below zero temps to set it and I do the rest. Gotta be patient I can't wait either and if all works out I will have it set up so the paint gun will siphon the water/clay solution from a 5 gal. pail. Michael, what kind of mixture are you going to use? Kaoline or something else? Well I have no clue where I could get or buy kaolin from but what I was thinking and this may sound like hillbilly tech but I will get a piece of soft creek clay from the creek across the road from our property and using my hand by dissolve it by rubbing my hand on it as if to wash with a bar of soap into the warm water and do experiments using the bottle on the sprayer. If all goes well I will have the sprayer siphon the solution out of a 5 gal pail. I also can't wait to get the 220 volt electric to my barn hooked up so the noisy air compressor will not wake my parents up when it kicks on to refill the tank. Great news Michael! What model searchlight you got? As for kaolin, it should be available from ceramist shops and in Finland at least costs really nothing. Getting clay from your backyard may involve some risk. We tried in Kilpisjärvi montmorillonite which is another clay material used in ice nucleation experiments, but it clogged the paint gun. Well, no wonder, because it is used in making concrete... According to Wiki it occurs often mixed with kaolin. But lets hope your natural clay does not contain this. You got the system automated? It is good if you can just leave it running while you photograph the halos. Anyway, this is really exciting. Lets hope weather turn soon favorable there. A short note on experimenting with other stuff. Sugar lowers the freezing point of water, so it should be avoided. Generally, as I have understood, anything that is soluble in water lowers its freezing point. Kaolin has been tested in many ice nucleation studies and we have seen it works very well. So, I would just stick to it. But is should be also warned that kaoline is know to cause lung disease, kaoline pneumoconiosis in workers with years continuous exposure. Last winter I had kaoline dust all over my room, especially on carpet and my nose had this continuous irritation feeling. I am wondering what is the effectiveness of application of chalk compared to kaoline? As I've read in some article, calcite (chalk) makes poor ice nuclei. I hope I remember well. I have also tought about making my own halos. Unfortunately I live in town...so making halos there is out of the question. Fortunately there's plenty of remote fields around it. That brings a question how to power all this thing in remote location. I guess I need a fuel powered electricity generator to power the compressor or somekind of hybrid mixture both of them. These should come cheap cause it's not every day the temps drop below -5 over here. Yes, calcite does not seem to be as good nucleator as Kaoline according to studies. There are many papers on kaolinite nucleating properties, some of which a available freely, like "Ice Nucleation Studies of Mineral Dust Particles with a New Continuous Flow Diffusion Chamber" and "Heterogeneous nucleation of ice in (NH4)2SO4-H2O particles with mineral dust immersions" (sorry, I had insurmountable difficulties to add links in this comments section). One thing to remember is also that below zero temps do not guarantee diamond dust conditions. There must be enough water vapor in the air to exceed ice saturation. When ice saturation is exceeded, then atmospheric moisture deposits on the particles that are produced with paint gun and diamond dust is formed. If tree wigs are getting frosty covering (which can be pretty thin in the beginning), then there should be conditions. If tree wigs have no frost on them, then air is too dry for diamond dust. Compressor what i have takes 2kw so you need at least 3kw generator, im not sure how much those cost, but is there any place where you can rent a generator? It might be cheapest way to try halomaking. In finland renting a generator from ramirent it cost about 30€/Day and compressor is another 20-30€/Day, but those are quite big. So you can use 2 paintguns at same time. If someone has huge compressor like KAESER, then it is possible to use at least 5 paintguns. As Riikonen said i have done many test with kaoline and without kaoline. And it seems that kaoline is the Magic powder what is needed. Without kaoline and water temp close to freezing nothing appeared even a single crystal. Then with kaoline water freezes instantly, even if you have water temps 50-60ºc, in my tests water temp was irrelevant to making halos, warm water only helps to prevent nozzles to froze. Here's the abstract of a very recent article (November 2008) by Eastwood et. al. on the ice nucleation of different mineral dust particles. The full article cannot be accessed freely, but even the abstact talks about quartz and calcite being poor ice nuclei. Marko I don't have a searchlight yet but I may get one of them too. for right now I will use a cheap clip on light for divergent light halos. My brother may have one or I could use the off road 100w lights on the rack of his truck. I'll get something figured out. Right now temps are in the high 60s to lower 70s perfect for tornadoes not halos. And last question - what is the best quantity of kaoline in aqueous solution to make halos? In Kilpisjärvi last winter, we used 2-3 spoonfuls of kaolin in a bucket (10 litres) of water. Something like that. That feels like spraying kaoline balls in the air. Maybe crystals would stay longer aloft with lesser kaoline. Michael, if you gonna buy that lamp, get HID spotlight. Walt has a good one, ask him. I don't know Walter Tape's email so could you send it? I may go to WAL-MART and see if I can get one that you plug into 120 volt outlet because I will be doing this near the house. Michael, the diamond dust you create may drift away from your house and even if not, the cloud will be large and the display is much better some hundred meters or more from the source because by then the crystals have grown larger. So better have batteries for the lamp so that you can move anywhere. I don't use the lamp battery no more, instead use 45 ah car battery. With that I don't have to think about having to change the battery in a middle of some important action, which has happened too many times already. It weight about 15 kg and must be carried in a backpack. I think I give it a tray...I now have all equipment needed...a air compressor, a fuel powered electricity generator, a descent paintgun and searchlight. The only thing I'm missing is a kaoline which I get in next week. 27/28 night we had -6 and frost all over the trees and roads. I just hope the temps stay until I get a chance to hit the road. To Riikonen...that's a good idea to use a car battery. Mine is running out after 30min continuous using. btw: did someone power-modified his Johnlite-2940...I'd like to hear about that ! I just replaced the 100W halogen with 130W bulb. Later, if I have money, will put 55W HID inside. I got also Black and Decker twin bulb spotlight, so might rather modify that by putting in two 55 HIDs'. Anyway, it is just so exciting that you and Michael are going to do it. And having that movable unit is again one step forward. Lets hope there will be good conditions. Yep Marko I hope all goes well or too well. As far as the light goes I will have a long cord that will go from my barn once electric is hooked up and since our property has a lot of hills I can place the light at different elevations for different halos. If I have to I may have to use the big bulky Snapper generator but its heavy and very noisy. I'd like to use electric cord more than anything. I have two types of kaolin to choose: a regular one and a regular porcelain kaolin...which one to choose..both comes in 5kg bag. The first one is slightly cheaper. Take a cheaper one. Its good enough. I dont remember what type was mine, but me and riikonen has a different kind of kaoline and both works. Thanks..I ordered the one you suggested. I worked through the '08 Jan, Feb and March weather reports and it doesn't look very encouraging. Only a handful of nights with temps below -5. I really hope its going to be colder than last winter. Conserning the temperatures, the forecast for Finland - even for southern one - is good starting new year. I would imagine also Estonia gets its share of that. Only thing that worries is that they forecast also wind. That means often dry air. I just tested my paint sprayer today with regular water to get an idea of how it works and how adjust the air flow and liquid and Marko you are right about the cloud of mist it makes its very large!! Even though it is not cold I just wanted to do a trial run and the only thing I did get was a mistbow with pastel colors. Just can't wait til it gets nice and cold.